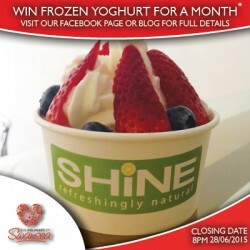 This weeks Business of the Week is SHINE based on Union Street – Swansea City Centre’s newest healthy option! Serving smoothies, juices, frozen yoghurt, organic soup and lots more! If you walk in and ask for a coffee, chances are you’ll be politely offered a healthy alternative! With a passion for personal healthier choices, Maria and Kevin decided to open the business back in April to encourage visitors and workers to the city centre to make similar choices. For your chance to win a Frozen Yoghurt for a month at SHINE simply visit our Facebook page and LIKE or COMMENT on the update (Or Retweet on Twitter)! Don’t forget to like our page too as we’ll be announcing the winner on Monday 29th June – SHARING the photo isn’t essential to enter the competition but it would be great to spread the word!